THERE WERE CALLS for all costs associated with maternity care to be scrapped due to the government’s intention to provide universal access to abortion services in Ireland. 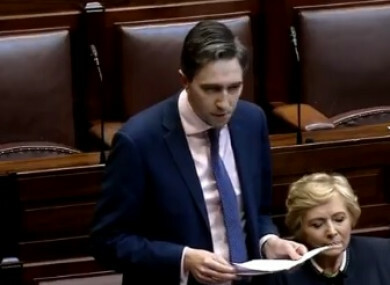 The Minister for Health Simon Harris introduced the Regulation of the Termination of Pregnancy Bill in the Dáil this afternoon. It seeks to legalise abortion services in Ireland following May’s referendum result to appeal the Eighth Amendment from the referendum. During the course of the debate, Harris said it is extremely important there be no cost barrier to termination services. Speaking in the Dáil today, Fianna Fáil’s Stephen Donnelly and Billy Kelleher said they supported today’s legislation. Both TDs said if abortion services are to be freely available to women, so should all costs and services associated with maternity. Donnelly said all costs including, appointments, specialised care, drug treatment and hospitalisation, which fall within the parameters of maternity care, should also be universally available. Highlighting one example, he said women who find they suffer from an extreme cases of vomiting and illness during pregnancy are often prescribed a drug called Cariban. The drug is available in the Coombe, Rotunda and Holles Street maternity hospitals, but is very expensive and not available for women on the medical card. Donnelly told TDs it can cost from €1,500 to €3,000 for the medication. “Lets remove the costs in their totality,” he said. Kelleher agreed, stating that the issue of maternity costs has to be addressed “very quickly” if the Bill before the Dáil is legislating for universal access to abortion services. He said it makes “obvious sense” there be a move for free maternity services for all. As Minister for Health, after all we heard during the campaign, after all I’ve learnt since I took this role, after everything we know of the dark past, I am determined we can begin a new chapter on women’s health. A chapter in which women are valued, their decisions are respected and they are cared for without judgment. This will be a priority for me in the time ahead. Today we begin the job they have given us, of making the law that follows the repeal of the Eighth Amendment and after 35 years in our constitution, in doing so, we are also making history. He went on to outline a number of sections in the legislation, such as how up to nine weeks gestation it is envisaged women will be treated by their doctor, but between nine and 12 weeks of pregnancy, women will be under the care of consultant obstetricians in hospital. Donnelly said politicians needed to question whether proposed amendments put to the Bill fall within the particular parameters of the Heads of the Bill. The Heads of the Bill is what people based their vote on, he stated. While he said there are aspects of the legislation that he did not agree with, including the three-day waiting period, he would be supporting it. He added that it is his understanding the inclusion three-day waiting period was political, stating that he understood it was added after a member of Cabinet questioned whether they could support the repeal of the Eighth Amendment. A number of TDs voiced their objections to the waiting period. Sinn Féin’s Louise O’Reilly said it was a “paternalistic” measure, stating that it assumes women are unsure about the decision they are making. Solidarity–People Before Profit’s Ruth Coppinger said the waiting period was not included in the Oireachtas Committee’s report on the issue, stating that such a measure is “unnecessary” and “patriarchal”. She said it would create a barrier for vulnerable women, adding that women from smaller towns and villages may have to travel to larger cities to see a doctor and would have to return there three days after the initial visit. Coppinger said the reflection period, which the minister said is used in many other jurisdictions, has been dropped in many countries, such as France. Solidarity–People Before Profit’s Bríd Smith said today should be celebrated, adding that she believed it was great that she was standing in the Dáil legislating for abortion. Email “Calls to remove all maternity costs for women as abortion legislation introduced in Dáil”. Feedback on “Calls to remove all maternity costs for women as abortion legislation introduced in Dáil”.